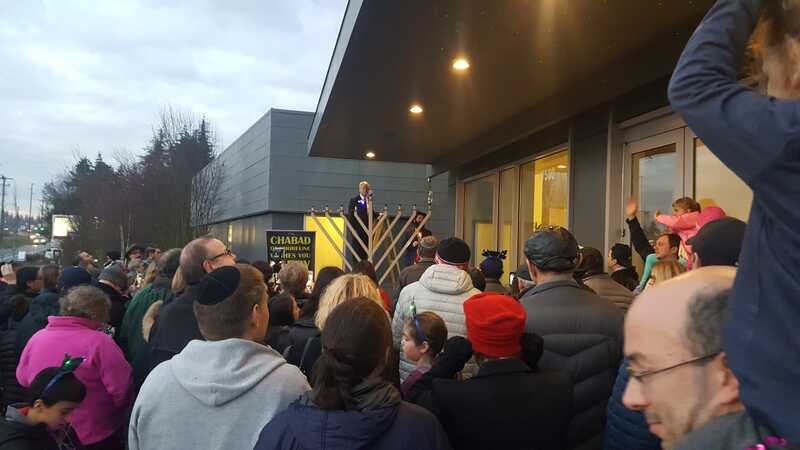 This past Sunday, December 2, 2018, Chabad of Shoreline kindled a public 9-foot Hanukkah menorah erected at Shoreline City Hall, followed by a community-wide celebration, the 1st night of the eight-day holiday. The ceremony, organized by Chabad-Lubavitch Rabbi Sadya Davidoff, featured prominent community officials, including Shoreline City Mayor Will Hall, who had the honor of lighting the first lamp on the giant Menorah, and Shoreline chief of police Shawn Ledford. Following the menorah lighting ceremony, attendees danced, sang and ate the night away. 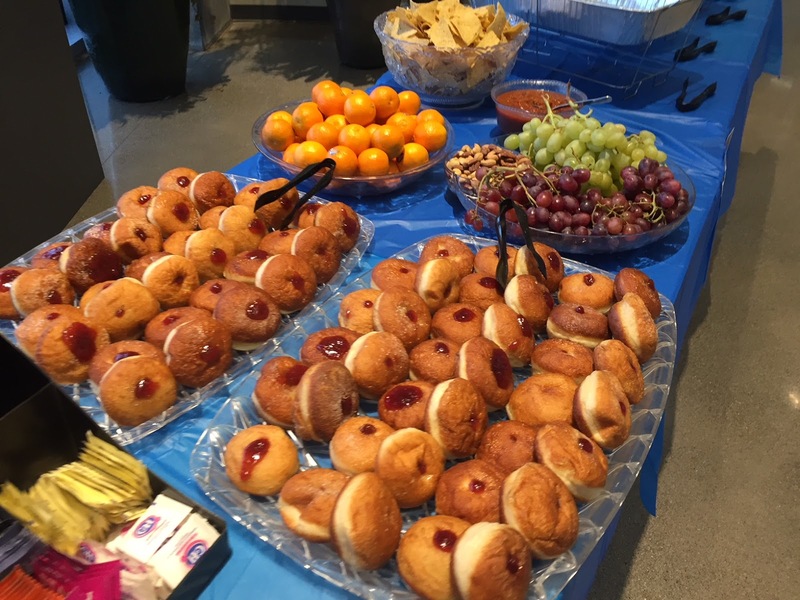 Delicious hot Latkes and homemade jelly donuts were served and a special Chanuka drawing on five amazing prizes was made. The children watched a special Olive oil factory presentation given by Seattle Rabbi Shimon Emlin. “The menorah serves as a symbol of Shoreline's dedication to preserve and encourage the right and liberty of all its citizens to worship G‑d freely, openly, and with pride. "This is true especially in America, a nation that was founded upon and vigorously protects the right of every person to practice his or her religion free from restraint and persecution,” said Rabbi Davidoff. "I want my kids to grow up with pride in their Jewish heritage and a feeling of equality and self-confidence as Americans” said Michelle of Shoreline, who is looking forward to attending the public menorah lighting. The Menorah lighting is part of the worldwide Hanukkah campaign, an initiative launched by the Rebbe, Rabbi Menachem M. Schneerson, of righteous memory, in 1973. The campaign highlights and encourages the central theme of the holiday — publicizing the story of the Hanukkah miracle. Today, the unprecedented public display of Hanukkah has become a staple of Jewish cultural and religious life, forever altering the American practice and awareness of the festival. 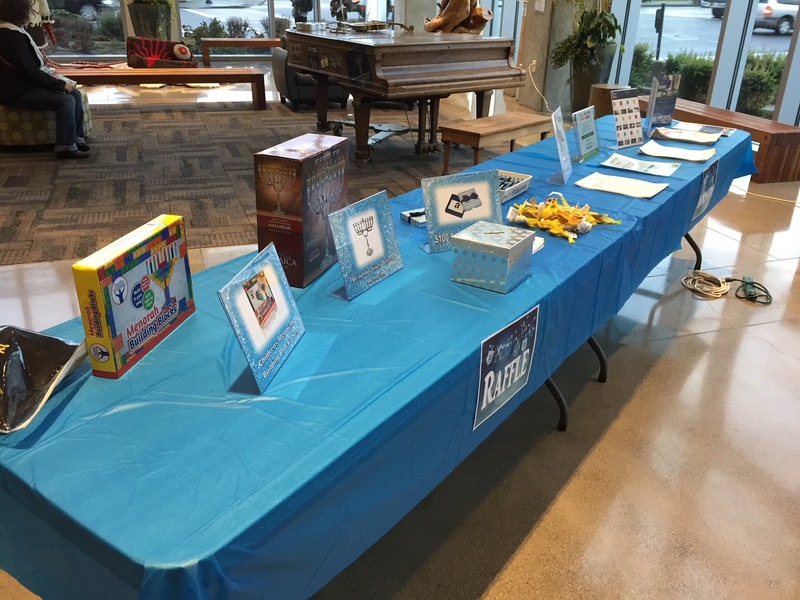 Throughout the State of Washington, Chabad is busy presenting dozens of Hanukkah events and celebrations, including public Menorah Lightings, Giant Menorahs made out of Donuts and Legos, Menorah Parades, Latkes Parties, Giant Dreidel Houses and more. To find a local event in Washington, or practically anywhere throughout the world, visit the international Hanukkah event directory. More information about Hanukkah and a local schedule of events HERE. Uhmm I thnk I missed something. You publicized the lighting in Lynnwood, but I didn't realize there was also one in Shoreline. Has no one in this area heard about the separation of church and state? Hopefully this is the last year a religious ceremony is held at our SECULAR government offices. Be sure to let us know when the Wiccans, Baptists, Sikhs, Hindus, etc in our community use the city hall for their holiday observances. I look forward to the Wiccan celebration at City Hall. They have awesome food! why is this such a big deal but christmas themed decorations aren't? i have seen tons of christmas decorations in government buildings, and i am expected to accept that, yet a chanukah menorah is a problem? and i receive the blatant misspelling of chanukah in the original letter - even though there are multiple commonly accepted spellings - as a reflection of disrespect for jewish culture; as a phd, i would think that ms. paulsen would realize this. Good job, Chabad of Shoreline! This is a great beginning. May your community grow and prosper. Keep spreading the light!